This is the only cake recipe that you will EVER need! My mother-in-law is famous for her Texas Sheet Cake, and we've all decided that her "white" version is the absolute best! This is the only cake recipe that you will EVER need! My mother-in-law is famous for her Texas Sheet Cake, and we’ve all decided that her “white” version is the absolute best! 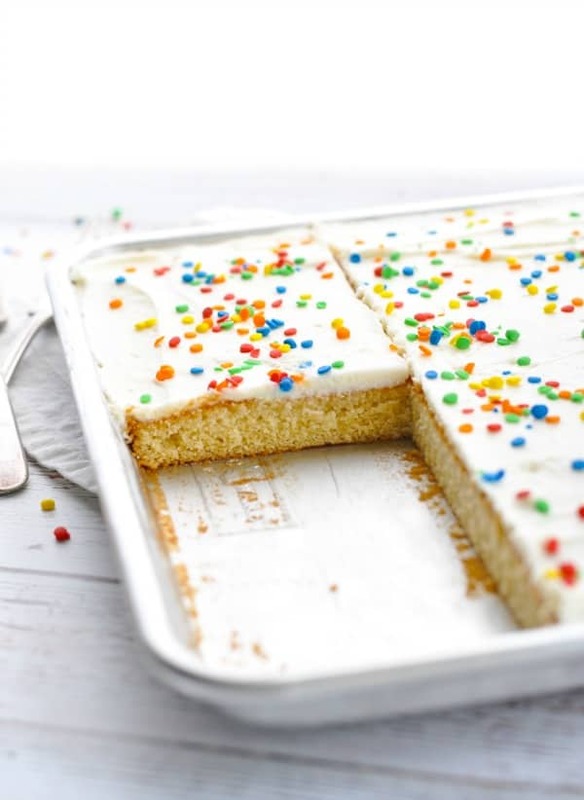 Whether you’re preparing a birthday treat for a child, a sweet dish for a school class, or a festive dessert for the next holiday, this easy homemade sheet cake can be decorated with sprinkles to suit any special occasion! 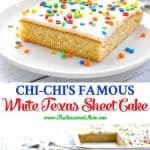 Can you believe that I had never heard of a Texas Sheet Cake until I met Keith? And since his mom is known for this dessert, it seems appropriate that it’s the first recipe that she ever served me! Actually, it wasn’t this exact Texas Sheet Cake, since Carole’s original recipe is for a chocolate cake with chocolate frosting. 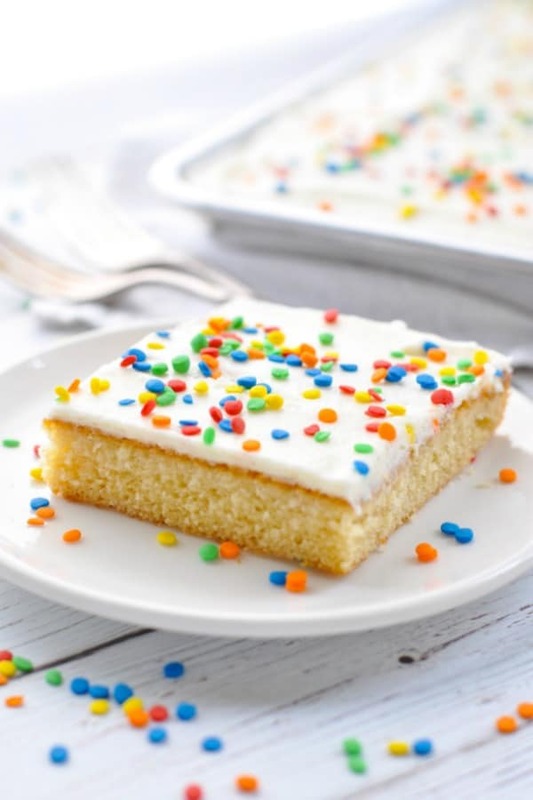 That version is amazing, too…but this simple white cake is the TRUE favorite among her grandchildren (and daughters-in-law)! Carole (or “Chi-Chi” as the kids call her) serves the dessert for many holidays, and definitely for all of the family birthdays. It’s such a versatile treat because you can decorate it to match any theme! Add black and orange sprinkles for Halloween, red and green sprinkles for Christmas, or rainbow sprinkles for a birthday party! 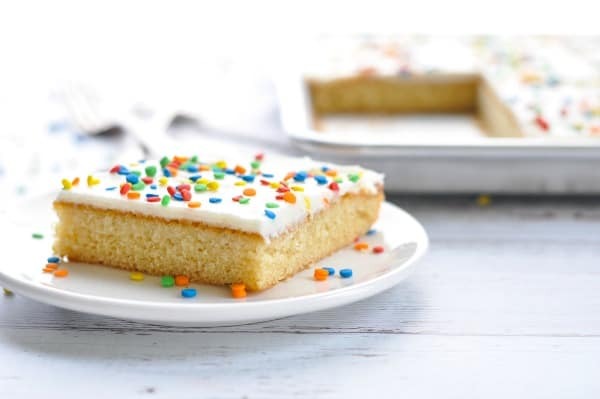 The kid-friendly treat appeals to big and little appetites, and it’s so much easier to eat than a big, thick, multi-layer cake or cupcake. Carole cuts the Texas Sheet Cake into small squares, which the 2-and-3-year-old grandsons can pick up and eat like brownies. 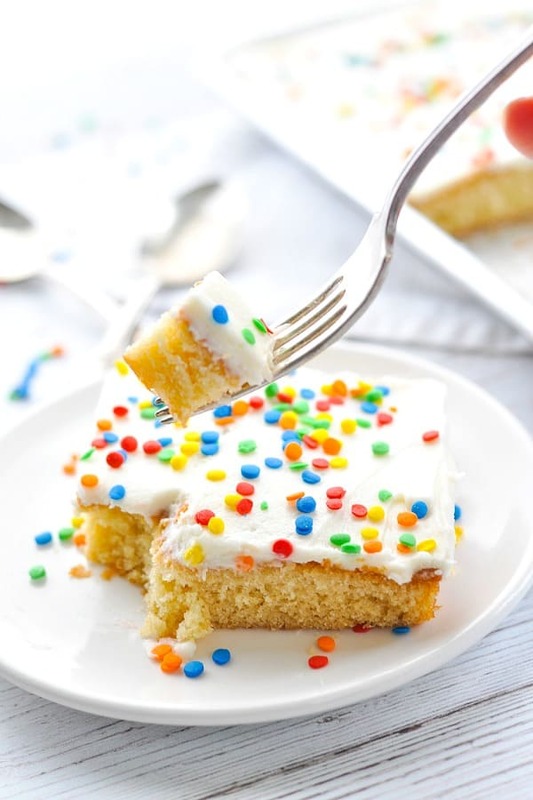 There’s no messy frosting smeared everywhere and there’s no need for utensils! It’s the perfect cake-to-frosting ratio! I cut this cake into 36 squares so it can serve a lot of people at parties and gatherings. If the thought of baking a cake or making frosting from scratch scares you to death, then don’t worry! This is definitely the place to start. 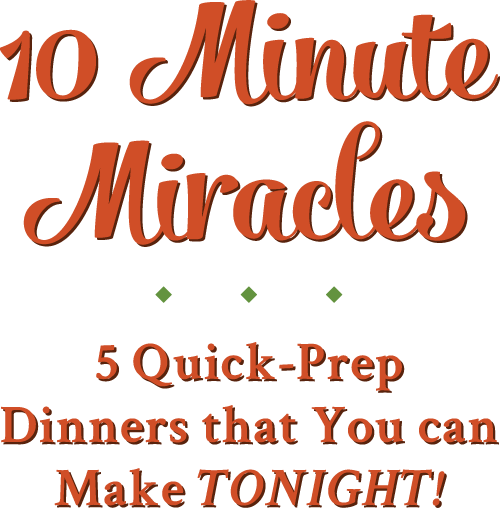 It’s so easy, and it only requires about 15 minutes of prep! After all, I’m the self-proclaimed Queen of the Boxed Cake Mixes, so if I can do this, so can you! The single layer cake is frosted with just a very thin layer of frosting, which means that it’s not a heavy sugar bomb. Yes, it’s a treat. No, it’s not health food. 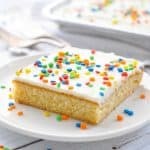 It’s light enough that I think it works perfectly as a “snack cake.” In other words, grab a mug of coffee and enjoy a small square of this cake for your mid-morning snack. It’s what I did on my birthday (and for the days that followed)! Carole’s White Texas Sheet Cake is a fluffy, moist and perfectly festive dessert for your next special occasion. You can easily adapt it with festive sprinkles for either Valentine’s Day, Easter or Christmas! 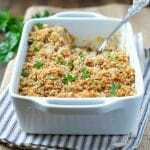 It’s a tried and true recipe that works and is always a big hit even more so than the traditional chocolate version! Yes, this cake is great for freezing even with the frosting on top. Cakes in general freeze really well for months! Once frosting you’re cake will keep well for 3 days in a cool dry place (covered) or place in the fridge for up to 1 week. 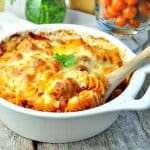 Make sure to use a non stick pan and grease it too this ensures it can be removed with ease. Make sure to cool the cake completely on a wire rack before frosting. You can easily adjust the consistency of the frosting by adding a little milk. It’s great if you feel you have overwhipped the frosting. Make sure to use softened room temperature butter or you will get lumpy frosting. 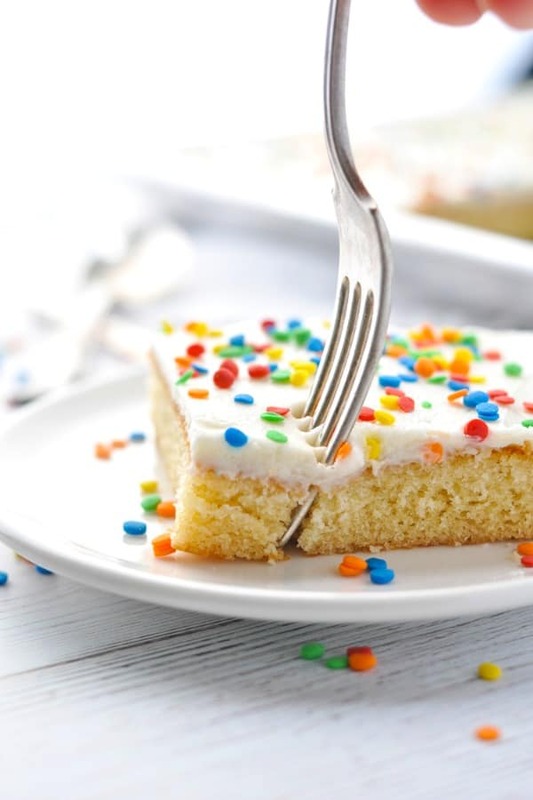 Use a spatula to make spreading the frosting easy. Grease a 10x15" non-stick jelly roll pan with shortening. Set aside. Prepare the cake: Bring shortening, butter, and water to a boil. Place flour, sugar, baking soda, and salt in large mixing bowl. Pour hot butter mixture over flour mixture in the bowl. Use an electric mixer to beat for 1 minute on medium speed. Slowly add the vanilla, almond extract, buttermilk, and eggs last. Beat for one more minute, and then pour batter into prepared pan. Place cake on a wire rack to cool. Once the cake has cooled completely, prepare Buttercream Frosting. In a large bowl, with mixer at low speed, combine confectioner’s sugar, butter, milk and vanilla. Beat with an electric mixer at medium speed for 1-2 minutes, or until fluffy and creamy. If desired, add more milk until the frosting is a spreadable consistency. Spread frosting on the cooled cake. Slice into small squares. You can easily adjust the consistency of the frosting by adding a little milk. It's great if you feel you have overwhipped the frosting. This cake keeps well on the counter (covered) for about 3 days, or in the refrigerator for up to 1 week. I use this size jelly roll pan, and I find that this offset spatula makes spreading a thin layer of frosting very easy! Can you replace shortening with anything? 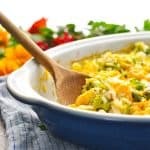 By the way, love your dump and bake meals! Hi, Amber! Not that I know of. I have never tried the cake without the shortening, so I have no idea what the end result would be if you swapped that out. Thanks, Kristy! It’s so great! Do you have Chi Chi’s recipe for Chocolate Sheet Cake? Yes! The cake recipe is exactly the same, except you omit the almond extract and you add 4 T of unsweetened cocoa powder to the shortening mix that you boil at the beginning. Bring butter, cocoa, and milk to a boil; remove from heat and stir in sugar and vanilla. Beat well until smooth. Ice cake while it is still warm. This cake is amazing! I’ve made something similar in the past, but this has a little more to it, and I will definitely be making it in the near future. That’s great, Diane! 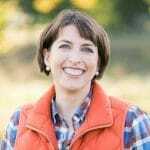 I agree — it’s amazing, and I hope that you get to try this version soon! 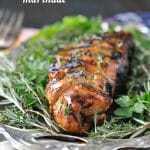 This is moist, delicious and cut well without crumbling or sticking to the pan. I didn’t have shortening or buttermilk so used butter and 1% milk. I doubled the almond flavoring and thinned the icing a bit more. Easy and fabulous! The site won’t let me rate but this is 5 stars!